Government organizations spend enormous amounts of money. They employ a large percentage of the work force. They have an undeniably huge impact on the national economy and wealth. Yet they are, for the most part, unmanaged. What passes for management is a combination of oversight and audit. Oversight is primarily reactive: offering negative feedback for failures and demanding additional rules and regulations to prevent reoccurrences. Audits look for "bright line" discrepancies and clear violations to those rules and regulations. Government operations are often criticized for "waste and mismanagement. "Yet the current situation, unfortunately, can best be described as one of "un-management" rather than "mis-management." Government can run better. 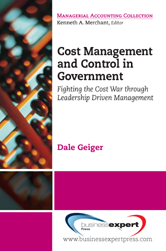 The purpose of this book is to look at how government can move from "rule driven" to "leadership driven" management. Specifically, it will document and discuss specific examples of successful cost informed decision making and cost management and control in government. It will also delineate the requirements of such success and explore the special needs of transforming the management culture of government from its well embedded past practices to a new paradigm of leadership driven management.